Ok I'll let it stand a week or two then unspoiler it with a little explanation. Glad that people here appreciated my review. After his entire world falls apart he makes a choice and shoots from zero to hero as a crime fighter known as "Black Lightning". Little does he know that evil forces are watching, they want the incredible car, and will stop at nothing to get it, even if it means killing him and destroying the city. Produced by Timur Bekmambetov (Director of Wanted and Night Watch), this fast-paced action-adventure features the Special Effects Teaam behind Wanted and stuntmen from The Bourne Identity & Quantum of Solace. My Thoughts: A superhero film from Russia which I found to be quite a fun little film. There are similarities with Spiderman with the reason behind the boys decision to become a hero and with a girlfriend in a love triangle. It took a while for Black Lightning to appear but when he did it seemed to me to be displayed well. 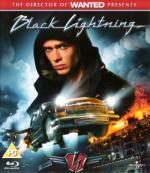 True enough Roger not the one you remember, this Black Lightning doesn't have any powers just the flying car. Black Lightning is a definately a movie I see myself watching again. 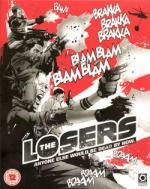 Overview: An explosive action tale of betrayal and revenge, The Losers centres around an elite Special Forces unit sent to the Bolivian jungle on a search and destroy mission. But the team soon find that they have become the target of a deadly double cross by a powerful enemy known only as Max. Now presumed dead, the group makes plans to avenge themselves and clear their names, joined by the mysterious Aisha, a beautiful operative with her own agenda. The Losers stars Jeffrey Dean Morgan (Watchmen) as Clay; Zoe Saldana (Avatar, Star Trek) as Aisha; Chris Evans (Fantastic Four) as Jensen and Idris Elba (The Wire) as Roque, in an incredible action adventure that has to be seen to be believed! My Thoughts: I haven't read, nor previously heard of, the comics that this film was based upon so cannot compare them. However I found this to be an acceptable park-your-brain type of a film. A tad OTT in places and a little far-fetched in others but generally enjoyable. 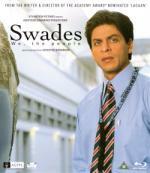 Overview: Set in modern day India, Swades (Our Country) is a film that tackles the issues that development throws up on a grass root level. A country that is grappling with problems that development throws up, the India of Swades is colorful, heterogeneous and complex, with people of diverse cultures and attitudes. It is to this environment that Mohan Bhargava (Shah Rukh Khan), a bright young scientist working as a project manager in NASA, returns to on a quest to find his childhood nanny. In his attempts to persuade Kaveriamma (Kishori Ballal), the symbol to him of motherhood and family, to return to America with him, he gets drawn into the life of a village called Charanpur and finds himself searching for answers to the questions of progress and development that the village is facing. His curiosity is piqued by Gita (Gayatri Joshi - film debut), an admirable young woman teaching in the village primary school, who chooses to live here despite problems like casteism, prejudice and a lack of basic amenities. The film uses the contrast between the highly developed world of NASA, which has been at the forefront of advances in space research, and this world back home in India, which is at the crossroads of development. What was a simple mission, prompted by nostalgia and affection, turns into a journey into the heartland of rural India, both literally and metaphorically. His quest becomes the journey that every one of us goes through in search of that metaphysical and elusive place called "home". My Thoughts: An excellent film. At its heart a love story with no real surprises but there is more with Mohan (Shah Rukh Khan) discovering himself along the way. Following his arrival at the village, where his nanny Kaveriamma (Kishori Ballal) now lives with Gita (Gayatri Joshi), Mohan finds himself attracted to Gita and also gets involved in the village way of life and the way that things are run there. This all leads up to an event where Kaveriamma gives him a task to complete and whilst on this task Mohan has an insight into the inherent problems of local village life. After this Mohan is attending a festival where the village council question him and he in turn questions them and he decides that action is needed to show his commitment. This is not the end though there are still a couple of further trials and tribulations. I did enjoy this very much even though the picture quality was very grainy at times, this I put down to the original material as the poor quality generally appeared on interior shots where maybe the director was limited on film stock or equipment to achieve his aims. 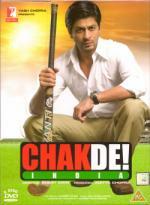 Next I recommend to you "Chak De! India".
. Order for DVD now placed with amazon marketplace. Kabir Khan (Shahrukh Khan) knows what it's like to come back from the dead. The ex Indian Captain has now come back in the avatar of the Coach of the Indian Women's National Hockey team. A team that exists more on paper & less in reality. The team is a rag-tag bunch of girls with their own agenda. A bunch of girls who have forgotten what it is like to play for the love of the game - of playing because you want glory for your country. Not because you want a pensioned job or a government flat. They have all forgotten the sharp thrill of just holding the hockey stick, keeping their eyes on the ball and playing for all they are worth. They have played every game but hockey to make sure they get selected every year in the Indian National team. But what does it really mean to play for the Indian National team? To play for India? "Mujhe sirf ek mulk ka naam sunaai deta hai - India"
The girls have never known the thrilling energy of being Team India. Of giving their all to see their country's name on a trophy. But Kabir Khan, once a captain, now forgotten, does. He knows what it takes to get there. And what it means to return empty handed. This time, he wants to make sure that it is different. He knows there are no second chances. Despite his past, he believes that if only the girls played as one, anything would be possible. Because Kabir Khan believes that it is not that we can't win. It's just that we never believed that we can. Chak De India is the story of a coach's fight of making his team, Team India by overcoming their diverse backgrounds, by learning to use everything that lifehurls on them as a secret weapon. It's a story about honesty, sincerity and integrity. A story to remind the nation of its National sport. A ragbag team of disparate girls are joined by their new coach Kabir Khan (Shahrukh Khan), an outcast since losing to Pakistan in a world cup final. It's his mission to take them to the world cup but first he has to get them to become a team. As I intimated earlier no real surprises, the girls gelling as team was clearly signposted once the ruckus started. Not too sure about how quickly Bindia Naik (Shilpa Shukla) switched her antagonism off after the coach tells her she is the only one who can save the team but then again that would have killed the film dead if she hadn't. Now what to recommend next. Maybe "Lakshya", a war drama with a little romance. It has singing (but not really dancing) and I was very much surprised how well the songs fit in the movie. Or maybe "Veer-Zaara", a romance drama I very much liked. Or "Ghajini", Bollywood's take on "Memento" I liked watching. Although it is very different to Memento with only some basics in common. Another Bollywood movie without song and dance numbers which comes to mind: "My Name is Khan"
Though I very much enjoy it, I fear that the Wilhemina subplot towards the end will make you cringe. But ignoring that subplot, this movie is recommendable. I will look into the others . Though it has pretty Preity Zinta in it and also Rani Mukherji ("Black"). Two of my favorite Bollywood actresses. I am a little envious that you get all these on Blu. For me it is too late as I have already all of the important Bollywood movies on DVD and I don't want to double-dip. There is one Blu double-dip I have my eyes on though ("Kabhi Khushi Kabhie Gham"), because the DVD suffers greatly from the 3.5 hours length. More so than most of the others.